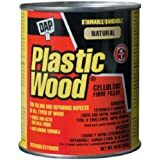 Amazon's Choice for "wood filler"
Sold by Miady and ships from Amazon Fulfillment. 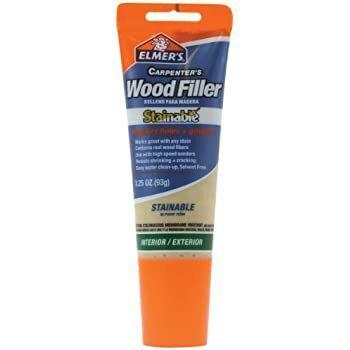 From filling nail holes in molding strips to filling gouges in hardwood floors, Elmer’s Carpenter’s Wood Filler tubes make the task quick and easy. 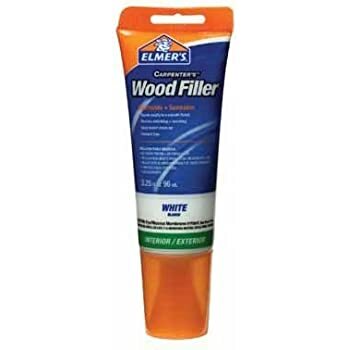 E855 Features: -Wood filler. -Paintable and sandable. -Resists shrinking and cracking. -Easy water clean-up. 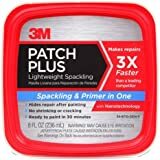 Name: -Spackling. Dimensions: Overall Height - Top to Bottom: -1.53 Inches. Overall Width - Side to Side: -6.9 Inches. Overall Depth - Front to Back: -2.5 Inches. Overall Product Weight: -0.36 Pounds. 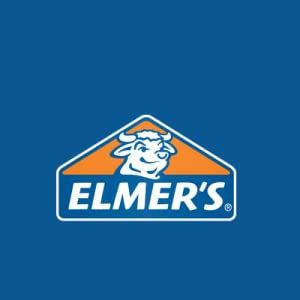 For more than 65 years, Elmer's Products, Inc. has been providing creative adhesive solutions that support success and turn ideas into reality. 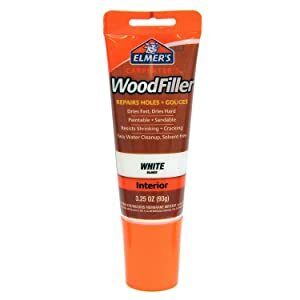 From filling nail holes in molding strips to filling gaps in hardwood floors, Elmer’s Carpenter’s Wood Filler tubes make the task quick and easy. 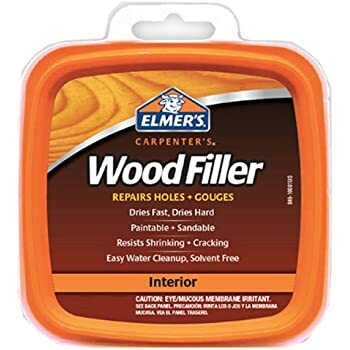 Carpenter’s Wood Fillers are sandable and paintable - and they come in six convenient colors. For interior use only. 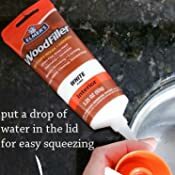 5.0 out of 5 starsSecret tip: put a drop of water in the cap! I love this stuff! Goes on and sticks very nicely, and when it's dry it's super easy to sand and have the patch look near-perfect. 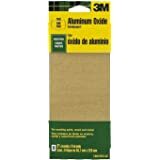 We have a lot of white in our house (trim, doors, cabinets, etc), so I use the white filler, which is a true white, not ivory or cream white. Doesn't take long to dry and paints over very nicely too, if you so desire. Secret tip: put a drop of water in the lid every time you close it up. It keeps 95% of the clogs away that stop the tube from being easy to squeeze. If you find yourself having to squeeze hard, it's time to put a drop of water in the lid, close it up for 5 minutes and then try again. It generally will be easy to squeeze again. Once or twice I had to use a skewer to poke out a clog that occured from it slightly drying inside from having it open/using it for too long, but every other time the water trick works. If you put in more than a drop, your first squeeze will be quite watery and runny, but after that initial runny burst it'll be fine. 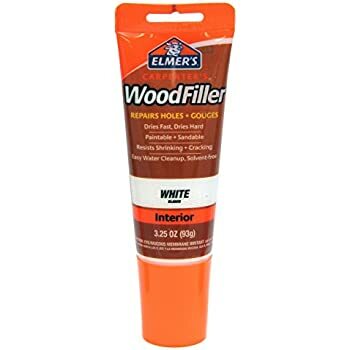 This Elmer's Wood Fill was a very good solution for filling three pretty deep scratches to a corner slat of our hardwood floors which were made by our new puppy a few years back. Now that the dog is a bit older and no longer in her 'damaging the house' phase, it was time to fill the holes made by her scratching. 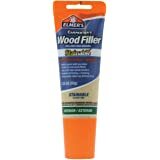 This Elmer's wood filler was the first product we tried and it turned out to be a fairly simple, effective and economical product to address the gouges. This filler application was easy; filling the voids with the spackle-like consistency of the filler which was squeezed directly from the tube. Getting it out is a bit difficult because of the filler's thickness, but overall that is a good thing because it does the filling job well. The color looks a bit lighter upon application but it dries darker and after a bit of fine grit sanding and some clear polyurethane as a topcoat, the floor looks almost back to normal. The filler takes about eight hours to dry and sets with a chalky consistency that sands off easily. If I were not aware of the scratches inflicted upon that area by our then new mongrel, I probably would not have noticed them and just thought it were the natural grain of the wood. I have attached BEFORE and AFTER pictures for reference. Overall, this a good product for a very reasonable price as long as the area you are filling is not too large. Good luck. I read the reviews carefully not sure what I needed to repair a old rocking. chair. My puppy chewed on the rockers.I so appreciate the expertise of the experienced woodworkers. I used all of the tips. Drop of water in the cap , 10 secpnds in the microWave and clear nail polish to seal. They all worked beAutifully. Mission accomplished. 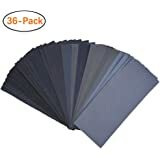 This was easy to use.fast free shipping. I'm very pleased. Needed to seal some baseboard cracks around some poorly coped ends before painting. 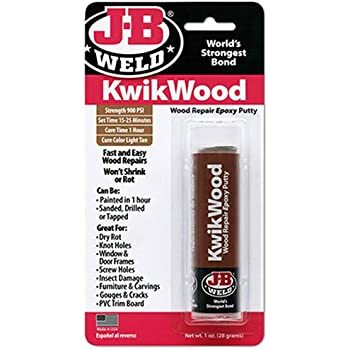 This product is a bit almost crumbly to work with at times, like a gooey drywall. However, it was simply to squeeze into the cracks and wipe off the excess prior to its drying to avoid a lot of sanding. That which did need sanded was very simple to get off. I simply used a high-grit paper the size of a bandaid at the end of my finger and was done in a few minutes. Once painted over, you can't even see the seam where the corner comes together. Someone was a bit too aggressive with sanding (oops) prior to purchasing this product and broke off the tiny top tip of the floor trim on another section. 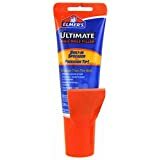 When partially dried, I used this product to reattach the tiny tip and reform a perfect corner. Again, it is completely invisible even to close inspection once painted over. 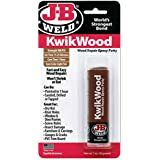 For those considering options: I had some neutral wood filler for interior/exterior use that said sandable and paintable. I tried it in the past and it stayed quite visible once painted and was far too gritty to work with on tight corners. 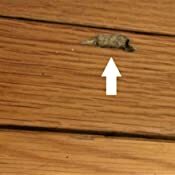 We have bamboo floors in our kitchen and over time, the putty used by the installer to fill nail/staple holes fell out. 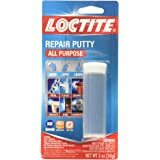 I tried replacing them with more wood putty, but the result was unsightly and still only temporary (the putty would often come out when the floors were washed). So I used this product instead and the results were great. 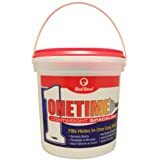 I applied it with a putty knife, let it set for an hour, then came back and gently washed the surrounding area with Murphy's oil soap to remove the filler residue and restore the shine of the floors. Perfect! 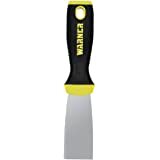 Worked exactly as advertised - used it to fill in some large gouges in a door frame where I had been overly enthusiastic with a chisel when adjusting the door swing. 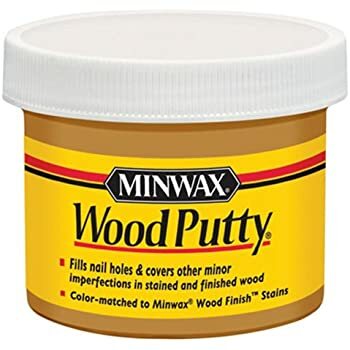 I previously used the Minwax wood filler but that is much more grainy and requires sanding. The Elmer's product is more like spakle when it is wet so it's very easy to work with and smooth - I just smoothed with a knife didn't end up needing any sanding at all. Note that because it can fill large cracks, you will likely use a lot - I used the entire tube on this job. This stuff works great! Good amount, certainly enough to fill a few hundred small nail holes. 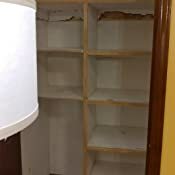 I used it to cover these awkward little Staples that my pantry was put together with and where the Staples are , there is a little recess that I wanted to even out. 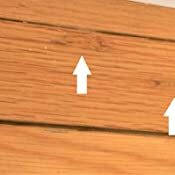 Also used it to Straight Up fill nail holes in the wood in other places of our house . The stuff dries quickly so you must work fairly quickly.